I read Stross’ Accelerando back when it came out (a decade ago! ), and though I enjoyed it I was left with zero desire to read more work by him. 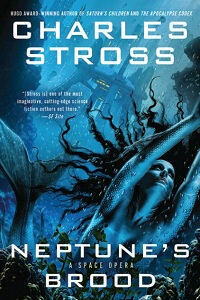 However, I recently picked up one of his latest books, Neptune’s Brood, and found myself enjoying it. The book is about some sort of futuretastic interstellar banker who’s on a secret mission that (halfway through the book) still hasn’t been explained. The narrator has a pleasant, conversational voice, and the book is mostly fun because it’s full of gosh-wow world-building and interesting treatises on futuretastic interstellar economics. In fact, part of me wonders if the book wouldn’t be better if it dispensed with the plot entirely and just kept the treatises. I mean, seriously, I think anyone who enjoys this book would actually enjoy it a lot more if it didn’t have this weird caper-y plot. Like what if it was just about an interstellar banker who went through the day doing banker things and thinking about banker stuff? I feel like that would be a lot more interesting, because when you read a book like this, you basically have two questions: a) How does all this cool stuff work? and b) what would it actually be like to live in this place? And while this book is doing an alright job of answering the first question, it actually does little to answer the second question, because everything we’re viewing is an exception. We’re not looking at a person’s ordinary life; instead, we’re looking at an extroardinary adventure that they’re having. And that, to me, is less interesting. Personally, I wonder what it would be like to live in this post-human world? What do people work for and strive for? What do they want? How do they spend their days? What is a delaminating anticorrosion treatment? What’s a fat umbilical trunk? What’s a node? When a wall or floor is exposed, what does that mean? What are the papery shrouds? Are the papery shrouds referring to the trunks or to the walls? What are the odd, gelatinous globules? What surfaces are fogged and filthy? Is it the surfaces of the pipes? Or of the globules? What it all adds up to is that you’re in some kind of space station and there’s metal and it’s a bit run-down. The image never gets much clearer than that, because none of the descriptions ever feel like they really come together. Instead of describing all this stuff, it’d be better to see just one thing clearly. But I understand why authors don’t want to do that. When they say ‘station’ they don’t want you to be thinking of Deep Space Nine or Babylon Five; they want to convey the sense that this is a really alien and different environment. But I think that’s a really tall order, and that the attempt to comprehensively sketch out the environment just leads to paragraphs upon paragraphs of description like the above, where zillions of words are expected to little effect.